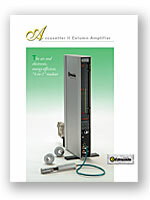 With its microprocessor base, the Accusetter II allows you to handle results in different ways. If you want to download gaging data to a PC, handheld, or printer, you can! For energy efficiency, you can opt to get your Accusetter II equipped with Auto-Air, an automatic air valve that switches the compressed air flow off during non-gaging use. When applied, this device can shave hundreds of dollars off your annual energy bill. To request full specifications and pricing information, Contact Us.